When you say "log cabin," I think of maple syrup or Abraham Lincoln chopping wood in Illinois. I don't think avant-garde French architecture. I love many French things, but this spin on a very old (American) theme ain't one of them. It's no wonder the design team, OLGGA, calls this the Flake House—it's pretty damn flaky. First of all, it's not really made out of logs, it's made out of wood with log "cladding." Next, it's intentionally broken in two "establishing a radical spatial boundary while materializing an unexpected entry sequence." And third, the windows are only on the ends. To top it off, there's no fireplace or chimney for those long cold Illinois winter nights. 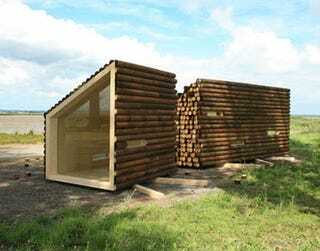 Though unorthodox, I don't totally object to fact that Flake House is portable: If you want a log cabin, it's nice to be able to call and order one up, rather than fell your own trees and stick them together yourself with mud, pray for the best. Besides, when it's on a truck, it's hiding in plain site: It just looks like a pile of logs, like the truck is on the way from the forest to the lumber mill, not to some rich French dude's house for a garden party.